(This post is focused on maximizing US Airways awards. Future posts will focus on American, Delta, United/Continental, Air Canada and British Airways. If you have any other suggestions, feel free to comment below or email me). US Airways is a Star Alliance member, which means you can redeem your miles on all 26 other Star Alliance carriers, plus Bahamasair, Hawaiian Airlines, Virgin Atlantic, Jet Airways and Qatar (economy only). US Airways does not do one-way awards (they cost the same amount as a roundtrip), but there are still a lot of ways to get maximum value out of your Dividend Miles. Don’t bother with usairways.com. Star Alliance and partner awards must be booked by calling 800-428-4322. Because partner awards can not be booked online, you don’t have to pay the $30 phone booking fee, but you will get hit with other fees and taxes. US is in the middle of the road with how much they charge for awards. They also have an annoying “processing” fee ($25 for domestic tickets, $35 for tickets to Mexico/the Caribbean and $50 for tickets to Hawaii, Europe, the Middle East and South America). Award levels are subject to change until the award ticket is issued. Waitlisting for award travel is not permitted. You can put awards on hold while you wait for miles to post, though some agents may be cranky about this, but they will do it when push comes to shove. A non-refundable quick ticketing fee of $75 applies to all award reservations purchased within 21 days of travel. Per usairways.com “Award travel is permitted when the distance in one direction does not exceed the maximum mileage allowed between the origin and destination. Certain itineraries are subject to mileage restrictions. Travel from North America to Europe is not allowed via Asia. Travel between Europe and Japan/North Asia/South Asia/Australia/New Zealand is not permitted via North America.” This rule has been broken many times by savvy Flyertalkers. The “maximum mileage allowed” referenced above is rarely enforced by phone agents. You can have one stopover or an open jaw (flying into one city and home from another). You cannot combine Star Alliance and non-Star alliance partners on an award. For example you cannot fly Virgin Atlantic to London and then Continental home. 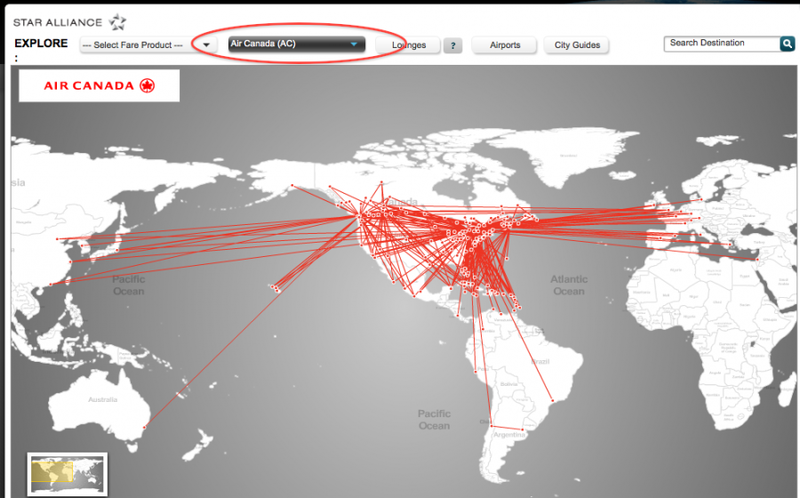 For your convenience here is a list of Star Alliance hubs per staralliance.com as of 6/16/11. z) United: Chicago, Denver, Los Angeles, San Francisco and Washington D.C.
Once you build an itinerary, the phone agent should be able to ticket it. If your itinerary is very complex with multiple partners, theres a chance they will send it off to a “rate desk” which will validate it and ticket. This can take up to an hour, but usually less. Your goal is to avoid the rate desk when possible. To find out which Star Alliance partners fly to which airports, click on the interactive mapand then select an airline from the drop down box to see their route map. 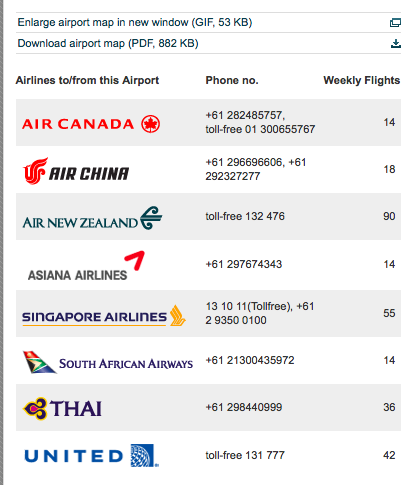 To see a list of which airlines fly to a particular airport, just click on the airport name on the map. For example, it will show you that Sydney is served by 8 Star Alliance carriers (Air Canada, Air China, Air New Zealand, Asiana, Singapore, South African, Thai and United). To check Star Alliance award availability, use the ANA Tool, continental.com (SaverPass availability) or aeroplan.com. Even if you find availability on other sites, you will only be able to book what the phone agent says is available. It can be completely frustrating, but sometimes US’ systems are not 100% synched to Star Alliance’s systems, especially when it comes to Lufthansa and Swiss First Class awards. If you feel like you have an inexperienced agent who doesn’t know the rules, politely let them know that you have to go and thank them for their help. Hang up and call again and hope to get a smarter agent. I have been using this technique for years. If you yell at an agent or sound like you are trying to scam them, they will notate your record/account and you don’t want that to happen. Kill them with kindness, even if your blood pressure is boiling! Agents used to allow “round the world” routing. For example US to Asia via Europe and then home across the Pacific. Generally agents won’t allow this anymore, but you may get one to ticket such an award, especially if you act like you aren’t trying to game the system. Frankly, they only know if it’s an around the world if their geography is up to par. For international awards, You can spend less than 24 hours in a city and it will count as a transfer. 24+ hours it will count as your single stopover, so plan your flight times wisely. Agents may try to incorrectly tell you that the max is 18 hours, but that is for domestic awards. There is a 10 segment max on award tickets. Each flight is one segment. This Flyertalk thread has loads of information on Star Alliance using Dividend Miles, so I suggest starting with the most recent and working your way back to see the types of award people have booked. In a nutshell, US Airways agents can be very lenient, so you can really juice a lot out of the awards you create – it just takes some research and persistence. US Airways has a pretty generous award chart, so once you master the art of booking a Star Alliance US award, you’ll realize why so many of us get excited when we see the US Airways 100% buy miles promotions (PS the current one ends June 30, 2011). As always, feel free to comment below with questions. The United Explorer card recently got some enhancements like 2 miles per dollar spent at restaurants and on hotel stays and a $100 Global Entry or TSA Pre-Check Fee credit. The $95 annual fee is waived for the first year. Limited time offer! Earn up to 60,000 Bonus Miles.